Who doesn’t love halloumi when the sun comes out to play? This simple, summer salad recipe is so easy to make and bursting with fresh, flavoursome aromas. Serve up on sharing platters alongside a sizzling barbecue and allow guests to help themselves. 2. Put the quinoa into pan and cover with chicken stock. Simmer on a low heat for 10-15 mins, adding more water if needed.
. Cook in the oven for 15 minutes. 4. While the quinoa and peppers are cooking, chop the beetroot, spring onions and tomatoes. Leave aside.
. You can also add a drizzle of red wine vinegar if to your taste. 6. Once the peppers and quinoa have cooked, take off the heat and out of the oven and leave to cool slightly. 7. Slice the halloumi and fry on a medium heat until browned in colour. 8. 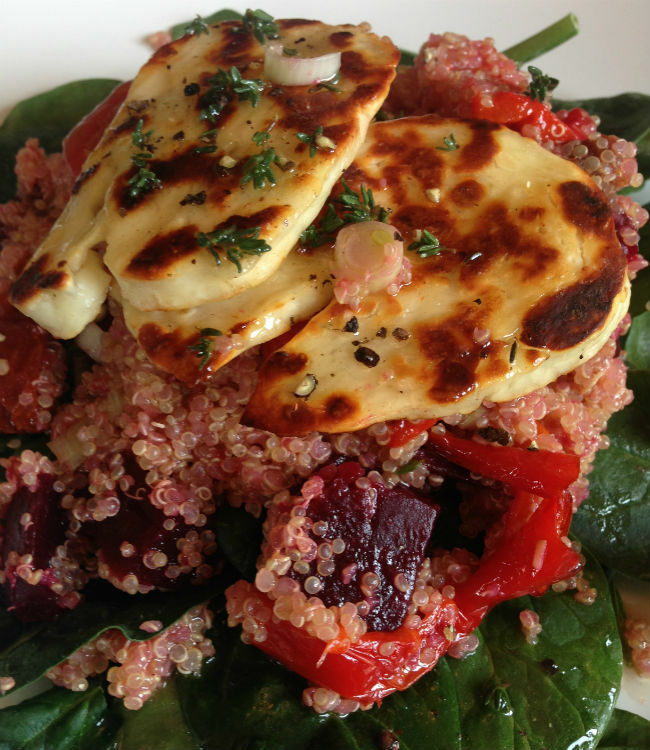 While the halloumi is cooking, mix the quinoa together with the beetroot, spring onions, tomatoes and roasted peppers. 9. Prepare a plate of fresh spinach then slather the quinoa mix generously on top. Top with halloumi, drizzle the sugary lemon dressing over and serve.